A company first, ThinkFun will be offering special versions of its newest game ‘Roller Coaster Challenge’, a fun and unique engineering challenge. ALEXANDRIA, VA – ThinkFun proudly announces the debut of its newest game, Roller Coaster Challenge. The game is the first of its kind, combining roller coaster building and logic puzzle concepts, and teaches children the basics of structural design. In honor of ThinkFun’s most highly anticipated game of 2017, the company has launched a Kickstarter campaign to bring limited edition versions of Roller Coaster Challenge to the world. 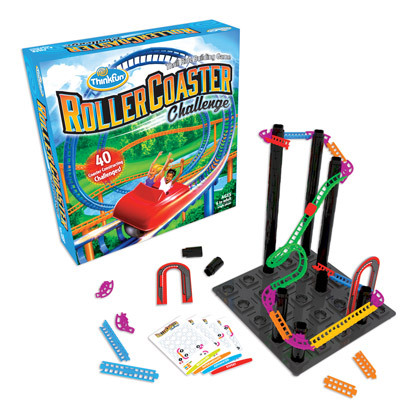 Created by Fuse, the inventors of ThinkFun’s hugely popular Gravity Maze game, Roller Coaster Challenge introduces basic physics concepts to children ages 6 and up. The game develops sequential logic and reasoning skills by allowing players to create a gravity-defying thrill ride in their living room. Roller Coaster Challenge comes standard with 40 challenges and 4 levels of play ranging from beginner to expert. Players also have the chance to design their own roller coasters with free-form building. The standard product may be purchased on Amazon, Barnes & Noble, Target, and will be retailed for MSRP: $29.99 this summer. The Basics – This package includes the standard version of Roller Coaster Challenge for an early bird price of $25. If You Love a Challenge – This package includes Roller Coaster Challenge, plus 20 limited edition extra challenge cards for a total of $30. Never to Be Seen Again – This package includes Roller Coaster Challenge, 20 extra challenge cards, and a Kickstarter exclusive blue-colored roller coaster car for a total of $35. The special blue cars will never be sold again after the Kickstarter campaign. The Kickstarter campaign is the first of its kind for ThinkFun. The campaign will begin at 9:00 AM EST on February 27 and end at 2:00 PM EST on March 31. A link to the Kickstarter page can be found here.